Many drivers in the market for an affordable vehicle have some reservations about choosing a used car. However, with a Toyota Certified Used Vehicle (TCUV) from Oxmoor Toyota, you can have many of the same benefits that you would get with a brand-new model. From a stringent inspection for quality to outstanding warranties, you may find it hard to believe that your certified used vehicle has had a previous owner. Toyota has made it their goal to offer only the highest quality used cars on the market. To ensure that top-notch quality, each pre-owned vehicle is subjected to an intensive 160-point Quality Assurance Inspection. 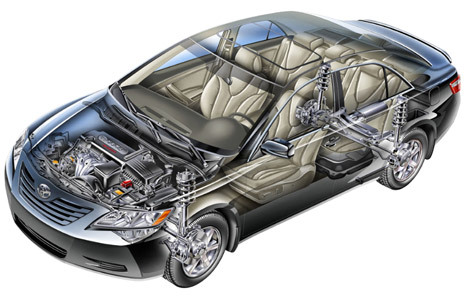 Any vehicle that does not meet their strict mechanical, appearance, and detailing standard is not designated as a Toyota Certified Used Vehicle. Toyota stands behind every automobile they manufacturer, and that confidence also extends to their Toyota Certified Used Vehicles. Since Toyota believes in their products so much, each TCUV comes with two separate warranties. From the date of your purchase, your car is protected by a 12-month/12,000-mile Limited Comprehensive Warranty, which covers the replacement or repair of any component that fails due to a defect from normal use. There is also a 7-year/100,000-mile Limited Powertrain Warranty that covers major transmission and engine parts as well as internally lubricated components. With every Toyota Certified Used Vehicle, there is also 1 year of Roadside Assistance. This benefit covers a majority of services such as jump-starts, flat tires, lockout service, and towing or fuel delivery. You are also reimbursed for the towing to the closest Toyota dealership. If you are in need, you can call toll-free for service 24/7. It is hard to put a value on the peace of mind that comes with knowing your vehicle has been thoroughly tested to ensure the highest level of quality. You may find a great deal on another used car somewhere else, but without a comprehensive inspection or the security of two outstanding warranties, that vehicle could end up costing much more in the long run. When you choose a Toyota Certified Used Vehicle from Oxmoor Toyota, you’ll never have to be concerned about having buyer’s remorse. 1 Whichever comes first from date of Toyota Certified Used Vehicle purchase. The Limited Comprehensive Warranty covers any repair or replacement of components which fail under normal use due to defect in materials or workmanship. (Program not available in Hawaii. )2Whichever comes first from original date of first use when sold as new. See your Toyota Certified Used Vehicles dealer for warranty details. Program not available in Hawaii. For AL, FL, GA, NC & SC, warranty coverage differs in the following ways: 7-year or 100,000-mile Toyota Certified Limited Powertrain Warranty coverage begins on January 1st of the vehicle’s model year and zero (0) odometer miles and expires at the earlier of seven years or 100,000 odometer miles.